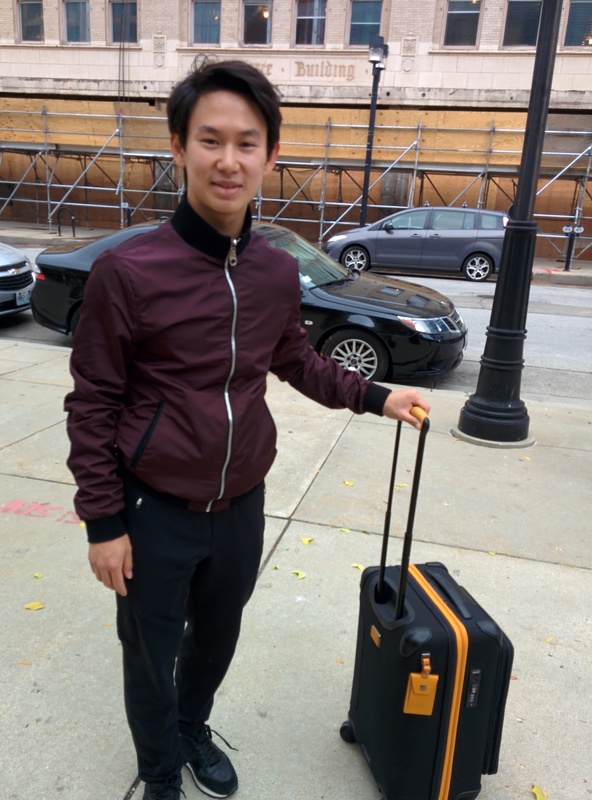 It was a whirlwind trip to Skate America, my first-ever Grand Prix event and my first-ever skating road trip. 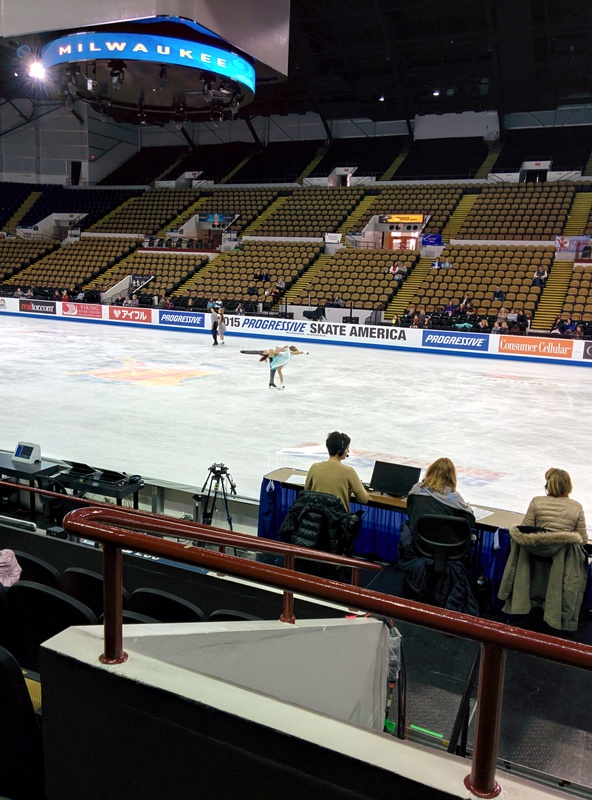 I’ll wrap up my coverage with some notes on my experience as a fan/writer at Skate America. The event was held this year at Panther Arena in Milwaukee. It’s a small arena, right in downtown Milwaukee, home base for basketball/hockey teams from University of Wisconsin. Because the arena is small, the whole event had a rather relaxed, cozy feeling. The seats themselves were a little cramped with not much leg room, and there wasn’t much in the way of concession food, but it was still nice. And again, because it wasn’t too big, there was a good view from pretty much every seat in the house. Downtown Milwaukee was attractive, but a bit sleepy compared to bigger cities. There weren’t too many people around on the streets, even on Friday, a work day. Nonetheless, there were many big hotels located conveniently close to the arena. I was able to get a discounted rate at the official hotel for the event, the Hilton City Center in Milwaukee. This was the first time I’ve traveled to an event, and thus the first time I’ve stayed at the official hotel. It was so much fun! The skater sightings started the moment I walked in the door, and continued right up until I left. Staying at the same hotel as the skaters and officials makes it feel like you’re part of the event. The hotel itself was very nice and very convenient, with a Starbucks, buffet room, and two restaurants on the first floor. And it was just a quick 5-minute walk to the arena. I arrived on Friday morning at 9:00 a.m., and the schedule was packed. There were practices until 2:00 on Friday, and the short programs went from 3:30-11:00 with just a brief dinner break. On Saturday, practices resumed at 7:15 a.m., continued till noon, then the long programs ran from 1:30-11:00, with dinner break. Having attended 2 full competitions now, I’ve learned there isn’t much time for sightseeing, relaxing, or even sleep at skating events, unless you skip practices. But I love watching practice, and I figure that’s what I’m there for, so I was pretty much in the arena or the hotel nearly the whole time except for the dinner break Saturday night, when my friend and I met up with a bunch of skating fans from FSU. It was great to meet some other skating fans!! Yup . . . I’m a fangirl! 🙂 It was so much fun seeing the skaters at a competition and getting a sense of their routine there. The skaters I met personally were all nice and very friendly. I wasn’t able to get many photos, unfortunately, but I’ve included a few below. It was a terrific weekend, and I’m already thinking about next year’s Skate America. It’s a great competition to attend because all-event ticket prices are much cheaper than Nationals or Worlds, but you still get to see many of the best American skaters and top international stars as well. I highly recommend it to anyone who hasn’t gone before. I don’t usually write reviews about ladies’ events, as The Naked Ice blog already provides thorough coverage of ladies. However, I thought I’d do a ladies review for Skate America just because I saw the event in person, and can perhaps share some perspective from seeing it live. Here are my observations & analysis of the ladies. 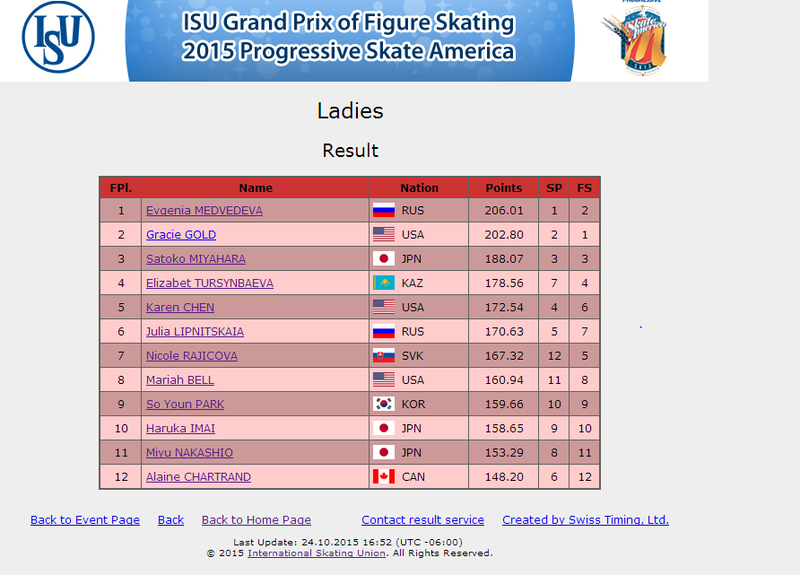 This was Evgenia’s senior Grand Prix debut. She certainly made the most of it, taking gold in Milwaukee. Medvedeva essentially won the event in the short program, where she posted a 5-point lead over Gracie Gold. Medvedeva’s SP was technically flawless, with a 3F/3T combo, 3Lp, 2A, three level 4 spins, and level 4 step sequence. She got almost all positive GOE (only two 0s on her score sheet) and also earned fourth-best PCS of 31.26. Going into the LP, Medvedeva had a big advantage but still had to skate well to win. She did just that, landing 3F/3T and 3S/3T/2T combos, plus 3 other triples. She did fall on her first double Axel, but that was the only mistake. Her spins were strong, with good speed and positions. She placed 2nd in the LP/1st overall to claim the title. Evgenia’s programs this season are to Melodies of the White Night and W.E. Both pieces are rather soft and subdued. I didn’t find either program particularly exciting or interesting. However, they do highlight Evgenia’s gracefulness, which, to me, was her most notable quality live. Her movement is gentle, fluid, and feminine. The choreography is too busy, but still allows this quality of hers to shine through. The judges responded, giving her generous PCS of 67.16 in the LP. With some judges going as high as 9.00 in their component marks, I felt Evgenia’s PCS score here was inflated. Aside from the graceful quality of her skating, what stands out most about Evgenia is, of course, her present consistency on the jumps. Her season is certainly off to an excellent start, and she is well-placed to hopefully make the GP Final. 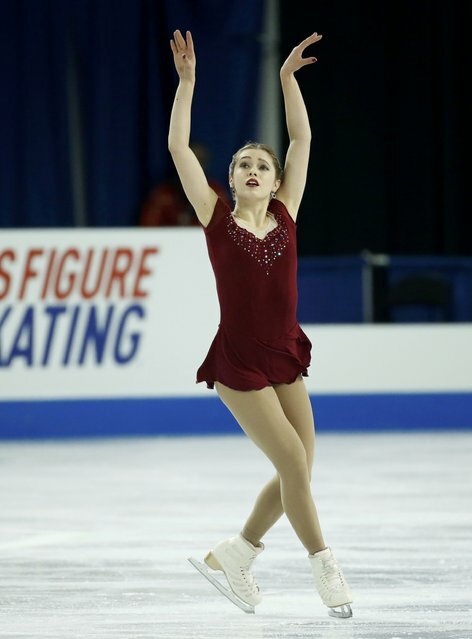 It was exciting to see Gracie skate so well in the LP in Milwaukee and win silver. It wasn’t a perfect competition for Gracie, but it was a heck of a lot better than her last few events, and I fervently hope that she can build on this success, gain confidence, and continue to improve. Gracie opened her El Choclo SP with an excellent 3Lz/3T combo that earned almost straight +2s. Next came 2 very good spins. But then Gracie popped the 3F into a double—an invalid element in the SP! She received no credit for the jump. But she got back on track with a good 2A. Gracie performed her tango program beautifully and had almost all +2s on her level 4 step sequence. Strong GOE kept her tech score high, and she had first-place PCS of 33.25. She finished the SP in 2nd. Gracie then took command of the ice for her Firebird LP. Once again she opened with her big 3Lz/3T, which earned 11.70 points (highest-scoring element in the event). She landed 3 more triples, then her 2A/3T/2T combo. Not only did she have all the jumps, the program was so well done and so exciting. The level 4 step sequence right in front of the judges was amazing, with beautiful sharp positions and wonderful pacing. Her step sequence was the only one in the LP to gain level 4, and she had almost straight +2s as well. Unfortunately, she doubled the last 3S. But the scores were still very high and Gracie placed 1st LP/2nd overall. The crowd was on its feet the moment her program ended, giving her a full standing ovation. It was a great moment for Gracie, one I’m sure she’ll remember for a long time. Watching Gracie at Skate America was so exciting. When you see her on practice, she’s just stunning. It’s not really about the jumps, either. Actually, they are somewhat secondary to her amazing carriage, posture, and presence. Gracie’s movement has such clarity, simplicity, and power compared to everyone else. Video doesn’t do her justice or capture the essence of her regal, breathtaking skating. I’ve seen some comments online that her LP was cautious and conservative, but all I can say is, it didn’t come across that way at all in the arena. It was captivating and went by so quickly. 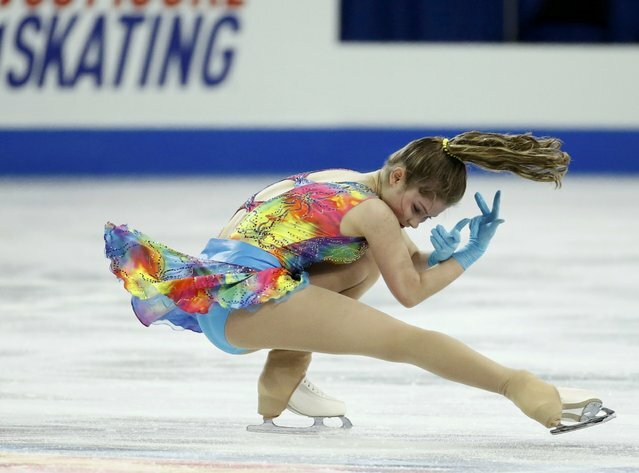 I’ve seen Gracie skate very well before live, at 2014 Boston Nationals, but she’s now reached a new level in my opinion. I felt more emotional presence and commitment from her, and her programs couldn’t be any better. All is in place for Gracie to truly excel this season. Let’s hope she finds the motivation and confidence to do so. 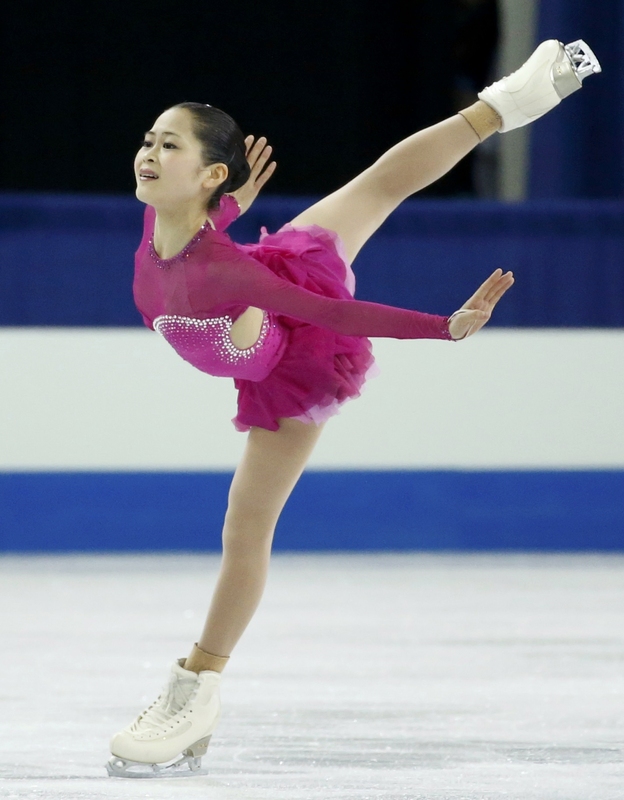 Satoko had a solid competition at Skate American and won bronze. She opened her SP with a nice 3Z/3T that earned +1s. Next came a gorgeous layback spin that got almost all +2s. Unfortunately the 3F was underrotated, but the rest of her elements were good. Satoko’s Firedance SP is a beautifully choreographed program and a nice showcase for her. She placed 3rd. Satoko definitely went for it in the LP. She landed a 3Lz/2t/2Lp, two 2A/3T combos, and 3 other triples, only falling on the solo 3Lz. Her spins had good speed and very good positions and scored well, but her step sequence was only level 2. She presented the program nicely, but I found it not as interesting as her SP. The Un Sospiro music feels like standard romantic classical, and the hot pink costume with layers of ruffles on the skirt didn’t really match the mood. In all honesty, I’ve never been much of a Satoko fan before this. But I did enjoy watching her live in Milwaukee. What stood out most is her attention to detail. Her skating is very refined and polished. Every move is delicate and precise and nicely finished off, even down to her hand positions. It’s quite rare to see such a young skater (just 17) pay such attention to detail; she reminds me of a young Sasha Cohen in this regard. 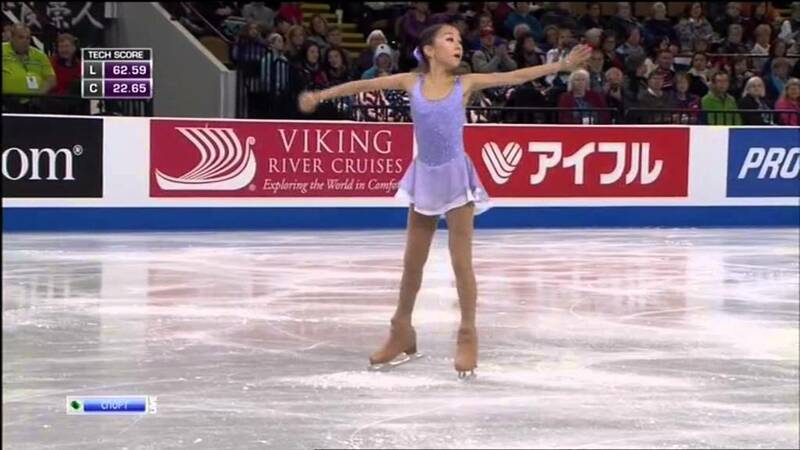 Satoko also has lovely, upright posture. I think it’s probably almost impossible to catch her in an ugly position! So, those are the positives with Satoko. The negative is what everyone already knows, and which seeing her live confirmed: Her skating is a little small compared to the other top girls. The jumps are small, and her footwork/stroking lack great power and speed. She’s not slow on the ice—but she’s not as fast as some of the others. The result: Her PCS is lower, and her GOE is mostly in the 0 to +1 range. In the LP, she gained less than 3 points’ total GOE, whereas Gold got 7 points and Medvedeva 9. Elizabet is so tiny and delicate, but she made a big impression at Skate America, taking 4th. She had a few technical problems in the SP. Her opening 3Lz was shakily landed and got negative GOE. Her 3F/3T combination lacked speed, and the 3T was underrotated, leading to more negative GOE. Other elements were good, and she finished 7th. I enjoyed her Send in the Clowns SP quite a lot. Elizabet has a natural musicality that is quite impressive in a 15-year-old. She really seems to be listening to the music, and her movement just flows naturally out of her. It feels spontaneous and organic–not studied at all. Elizabet’s Papa, Can You Hear Me? LP certainly had plenty of firepower. She landed 3Lz/2T/2Lp, 3S/3T, 2A/3T, and 2 other triples, the only mistake being a fall on 3F. With her small size, Elizabet does lack power in her skating. Her jumps have little runout; her spins are just average in speed, and her stroking/footwork is not as fast/powerful as the older girls’. Nonetheless, her jumps could not be denied and she took 4th in the LP/overall. She had the highest base value in the LP (63.07) but gained only 2 points’ GOE. I’m not usually a fan of tiny junior jumping phenoms, but Elizabet’s musicality and grace make her special. I look forward to seeing how her skating develops. This was Karen’s Grand Prix debut. She had some ups and downs in Milwaukee but managed to place 5th. Karen opened with a strong SP to “Violin Fantasy” from Turandot. She two-footed and underrotated the 3T in her 3Lz/3T combo but still earned 8.40 points. Her solo triple loop came out of difficult turns and was very good. The highlight was the ending of her program, which featured a very well-placed spiral and 2 extremely good, fast spins. Karen earned +2s/+3s on those spins and was a strong 4th in the SP. Unfortunately, the LP didn’t go as well, with 2 falls and a spinout on her 3Lz. Karen did land a lovely 2A/1Lp/3S combo with great ice coverage. Her spins again had good speed, as did her footwork. But I think her team needs to take another look at her LP packaging. The Les Miserables program is bland, and her flashy, heavily sequined costume doesn’t reflect the theme. Karen still got 5th-place PCS (58.52), though, to place 6th LP/5th overall. Last year, I really didn’t get all the excitement around Karen. Seeing her live, I understand a little more. Technically, she is a strong skater with excellent spins, good speed, and jumping ability. I wish that her positions were more elegant and that she had more musicality. But perhaps that will come. Meanwhile, the biggest thing she needs to work on is jump consistency and controlling her nerves. Watching Julia on practice at Skate America was interesting. It was like there were 2 different Julias out there. Whenever Julia’s music came on and she started her choreo, she looked good–like the skater I’d seen on TV. But the very instant the music/choreo stopped, her shoulders would slump heavily forward, her head would drop forward, and she would stroke around with a preoccupied, intense look. I did not see this dramatic contrast in “performance” vs. practice mode in any of the other ladies. Julia had a decent start to the competition with her new Elvis SP. She landed a fine 3T/3T, but her 3F was underrotated. I actually enjoy this program for Julia, perhaps simply because it’s different for her. The first section is lyrical and suits her style. The second section is actually kind of fun! Seeing it in person, I could better appreciate how some of the choreo moves are cleverly set to the lyrics. I thought Julia performed the step sequence pretty well, and the crowd seemed to enjoy it. The steps and program still need more speed and energy, though. She had third-best PCS (31.40) and placed 5th. Her Leningrad LP did not go quite as well. Julia managed to land a 2A/3T combo and 2 other clean triples. However, she two-footed a 3F, singled the 3Lz, and had a scratchy landing on the second 3F. She earned only 47.48 in TES (10th-place TES) and was 7th LP/6th overall. For a girl who was ruling the world with triple/triples just a year and a half ago, it was a tough outing indeed. Her PCS (60.91) kept her in it, but I felt these marks were inflated; the mistakes definitely marred the impression of the program. Her flexibility continues to wow audiences. She lacks good “run of the blade,” if you will. Her skating slows when not doing crossovers; she does not maintain speed and flow through difficult footwork like some skaters can. Julia is obviously struggling mightily with the jumps at this point, with the arrival of puberty. Although I’ve never been a big fan of hers, I hope she can make it through this and come out the other side. She’s going to have to dig deep, forget that she was once skating’s “It” girl, and find a new, mature persona and style on the ice. I’ll be honest—I had never even seen Nicole before this competition. But I will remember her now. What a moment for Rajicova! Nicole skated her short program to Jennifer Hudson’s bluesy/jazzy rendition of “Feeling Good.” I enjoyed the music, but the program itself was somewhat forgettable, and she placed last. Then Nicole came out and shocked everyone with a great performance in the LP! She landed 3Lz/2Lp, 3Lp/2T/2Lp, 3Lp/2T, and 3 more triples! Her spins and footwork were average, and the Dr. Zhivago program generic, but it was still a great performance from her and she deservedly placed 5th in the LP/7th overall. I think we’ll see more Grand Prixs in her future. Mariah’s practices at Skate America were really rough, with many falls and tough landings on her jumps. But she was able to pull it together in the competition and put out stronger performances than she did in her two senior B events this fall. Mariah started her Storm Cry SP with a good 3F/3T that earned +1s. Next came a really lovely Biellmann spin and a good 2A. Unfortunately, she fell on the 3Lz, which sucked some life out of the program. She placed 11th. Her somber Fourth of July LP began with another fall on the 3F/3T, and I was worried, but then she pulled out a good 2A/1Lp/3S that got positive GOE. From this point, the program was stronger and she landed 4 more triples (1 UR). I really love this program for Mariah; it’s dramatic, and she has such wonderful extension and polish in all her movement. She has decent speed in the footwork and really gorgeous positions in the spins. I’d like to see more power in her skating, but I enjoy watching her a lot. Mariah didn’t get much PCS/GOE love from the judges, but managed to pull up to 8th LP/overall. So Youn placed 5th in both her Grand Prix events last year, so her 9th-place finish in Milwaukee was disappointing. She opened her SP with a big 3S/2T, but no doubt was hoping for a 3S/3T combo instead. She also had an odd hop going into her second spin, which resulted in -3 GOE. She was only 10th. So Youn skated her LP to Red Violin. The program started off quite well, with a 2A/2T, 2A/3T/2T, and 4 other triples. But then it all fell apart in the last minute!! First So Youn fell on the 3S, then she had mistakes on BOTH of the final spins! The judges were quite harsh, and she finished 9th LP/overall. I was really disappointed with So Youn’s finish, because there is a great deal to like in her skating. She has a beautiful 2A and good runout on most of her jumps. Her skating skills are solid; she sustains speed nicely through step sequences and transitions. And she has quite nice posture and line, too. But after seeing So Youn live in Milwaukee and reviewing the judges’ score sheets, it’s clear something is not working with her overall package. She doesn’t shine the way she should, and she’s not getting the judges’ respect. I think So Youn needs better programs that will bring out her personality more and let skate more freely. The Red Violin music, in particular, is dark and weighs her down. I’d like to see her skate to something upbeat that would show off her skating skills and let her sparkle a bit. (She’s kinda short on sparkle right now.) Another area to work on is spins; she needs better positions and more speed. Haruka turned in two graceful but flawed performances here to place 10th overall. Haruka has a nice, light quality, and she’s a pretty skater to watch. But somehow, her performances just didn’t stand out much for me. She was 10th overall. This competition was Miyu’s Grand Prix debut. She landed a big 3T/3T combo in her SP that earned +2s. However, that was pretty much the highlight. She was a surprising 8th in the SP but had a number of problems in her Scheherazade LP and fell to 11th LP/overall. Miyu has nice, high, springy jumps (when she lands them), but otherwise there is not much distinctive about her skating. Alaine broke my heart a little in this event. After a strong short program, she had a nightmare performance in the LP and fell all the way to last place. It was really sad to see, because I quite like Alaine’s skating, and you never want to see a skater go through that. For me, Alaine’s Pina SP was really one of the highlights of the entire Skate America event. I think this program is simply brilliant. The music is compelling and the choreography so interesting, with rapid turns, quick changes of direction, and unique movements. Not only that, I was so impressed with how well Alaine performed it. She really owned the choreo, skating it with authority, fluency, and no hesitation. The program went by in a flash, and I loved it. There were a few technical problems—the 3T in the 3Lz/3T combo was downgraded, and the 3Lp was a little tight. But the other elements were strong, and I was glad to see her rewarded with a level 4 StSeq and +1s/+2s. Alaine’s PCS lagged 2 to 3 points behind Medvedeva’s and Lipnitskaya’s in the SP, which I didn’t agree with at all. I would have liked to see her score much higher, and hopefully she will later in the season. As good and exciting as her SP was, that’s how bad Alaine’s LP was. She suffered a near-complete meltdown, with 3 falls and mistakes on almost every jump. Alaine did actually start the program with a triple Axel attempt, but it didn’t work. I hope Alaine can just look on this performance as an aberration that will in all likelihood never happen again. The Grand Prix season finally got underway this weekend at Skate America! 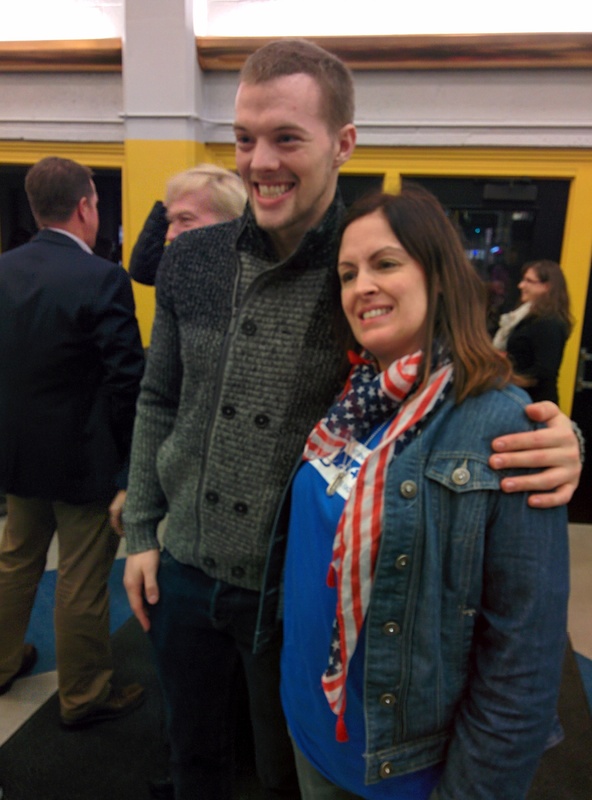 It was an exciting event–especially because I was there in Milwaukee to see it live! 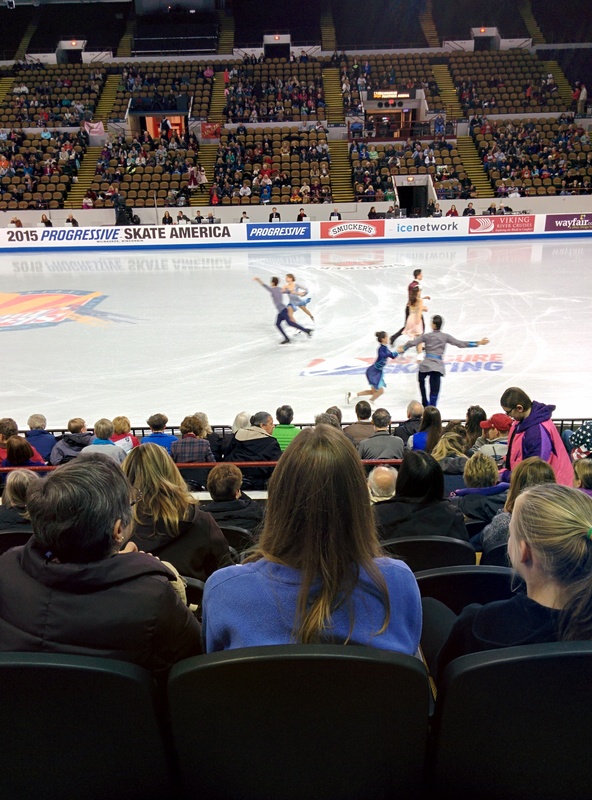 Skate America is the first Grand Prix event I’ve ever attended, and it was so much fun. It was a whirlwind 2 days of constant practices/competition, and I enjoyed every minute of it! I’m going to try and do several blog posts to share my impressions (noting what looked different live vs. on video). First, let’s look at the pairs event in Milwaukee. This event was a tale of two different competitions. The pairs skated very well in the short program, but the long program was a different story, and not a good one in many cases! Sui/Han won their first Grand Prix gold medal in Milwaukee. It was a solid victory, and they had a 10-point lead on the rest of the field. That said, Sui/Han are capable of much more than what they showed in Milwaukee. Wenjing/Cong’s Spanish Romance SP was marred by a missed transition on the combination spin. They earned no points for the spin and, as a result, were in second place after the SP. The rest of the program was fine. But seeing it live in the arena, their speed/amplitude was a little less than I had expected, and overall it was good but not great. Their Samson & Delilah LP started with a very nice quad twist that earned +2s/+3s. Next came their SBS 3T/2T/2T combo. They landed the combo but with almost no runout. Sui/Han then opted not to try the throw quad Salchow, which they had landed at the Chinese test skates, going for throw 3S instead. 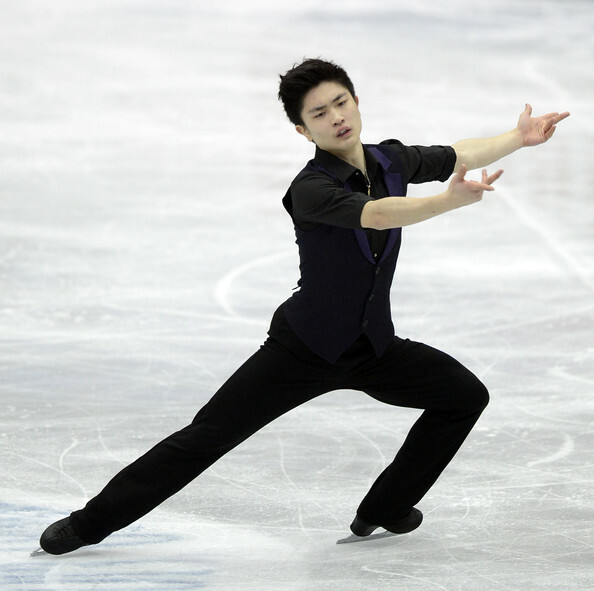 Cong Han later had a hard fall on the SBS 3S, which disrupted the program. They recovered with an amazing throw 3F, which received a perfect score (straight +3s). All in all, it was another good but imperfect performance from Sui/Han. Their new Samson & Delilah SP is dramatic and has lots of lovely, interesting transitional moves. And Wenjing, in particular, is looking terrific with her new sassy, short haircut and shimmery blue LP dress. I think Sui/Han’s packaging is strong this year, but it seems like they are not in peak condition yet. They didn’t look quite as sharp and fast in Milwaukee as I was expecting. I think they’ll want to work on their conditioning and performance level prior to Cup of China and the GP Final. On the plus side, Sui/Han had easily the best lifts in the competition at Skate America. All their lifts are complex and have great ice coverage and smooth transitions. Watching them live, they really were in a class by themselves with lifts and got almost all +2s/+3s for their lifts in the long program. Next: Cup of China, in 2 weeks. 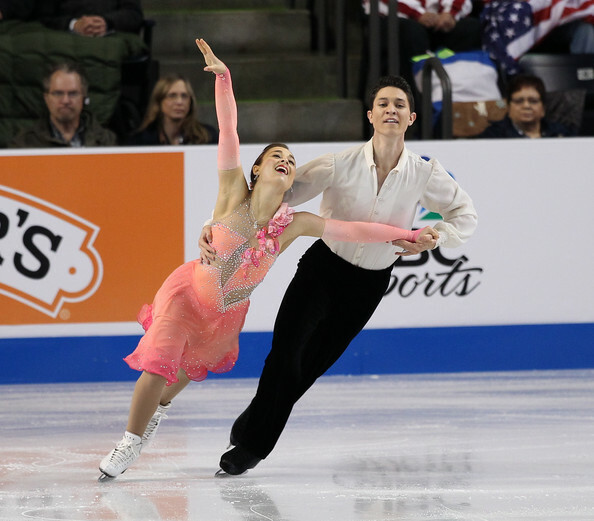 This competition was a breakthrough for Alexa/Chris; They earned their first-ever GP medal! The competition was, at once, both a great success for them and yet also a bit disappointing, as they had 3 falls in the long program. Going into the LP, Alexa/Chris were in first place, a new position for them internationally. Unfortunately, the nerves showed in their LP. Both fell on the SBS 3S, and Chris fell on the SBS 3T. But there was still a lot of strong content. They landed the quad twist and a very strong throw 3F. Their lifts weren’t quite as good as usual but still earned positive GOE. Their PCS was also good: 63.14. I think Alexa/Chris’s new LP to Elizabeth: The Golden Age is a good vehicle for them. 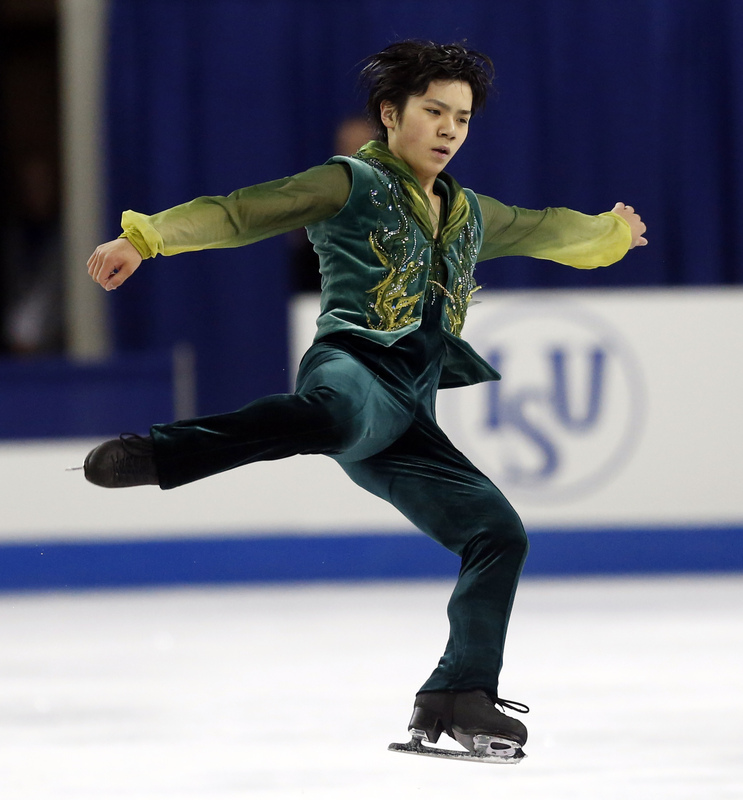 The music is strong and dramatic, which brings out more intensity and purpose in their skating. They can still work on their expression, but I think they’re on the right track. What stood out to me, seeing Alexa/Chris live, is the bigness of their skating. They’re a relatively tall team, and this enhances their presence on the ice. Their lifts are higher than anyone else’s, their twist is huge, and they have a charisma that’s more noticeable live than on video. Did Alexa/Chris miss an opportunity to win here? Hard to say. Their previous personal-best LP score, had they duplicated it, still wouldn’t have beat Sui/Han. Ultimately, I think winning the silver medal is a victory on its own and hopefully, the whole experience will help them be better prepared in the future. Step by step and competition by competition, they continue to get closer to the top pairs in the world. The Grand Prix Final is now a real possibility, but they’ll need their absolute best at NHK. They have to start putting those nerves aside and skate full out. Nothing less will cut it in Japan. Fortunately, they have another event beforehand to help them gain confidence. After a rough outing at Nebelhorn, Julianne/Charlie came back with a much stronger performance to win their first Grand Prix medal. They opened with a good SP that included excellent SBS 3Ss and a very nice death spiral. Their step sequence was also well done, earning many +2s, and they placed 4th. I have mixed feelings about their new Cirque du Soleil SP. The intricate choreography and quick tempo show off their speed, and yet the music is so bouncy and happy that it feels a little juvenile compared to the top teams. It accentuates S/B’s youth and perk, and I’m not sure that’s a good thing. I love the originality, though. Julianne/Charlie followed with a very good skate in the LP. Their triple twist is higher this year and earned positive GOE. Their SBS jumps were pretty good. Julianne put a hand down on the throw 3F, but the throw 3Lp had excellent distance and got +2s. I’m enjoying their A Whiter Shade of Pale LP. The choreography really builds at the end of the program, matching the swell of the music, and the whole package is very effective. I love that this team is trying out different music and choreographic styles and avoiding typical warhorse programs. It works for them and helps them stand out. Julianne/Charlie placed 3rd in the LP and overall to win an unexpected bronze medal. The biggest story of this event was Stolbova/Klimov finishing off the podium. I don’t think anyone saw that coming. The problems started right away in their “I Put a Spell on You” SP. Stolbova/Klimov’s opening triple twist was very low and crashy; they received GOE marks as low as -3. The SBS 3Ts were good, but then Ksenia fell on the throw 3Lz. Clearly rattled, she slipped during the step sequence, and even the lift was a bit shaky. This slow-burn, sultry program has lots of potential, and should score well with a cleaner performance. The Olympic silver medalists finished this segment in 5th place. Stolbova/Klimov rallied to start the LP in stronger fashion. The twist was better, and they landed their big new element: SBS 3T/3T/2T. This combo earned 10.30 points and was the highest-scoring element in the whole event. But then problems crept back in. Ksenia stepped out of the throw 3S and fell on the SBS 3S (another new element); also their SBS spins were too close and off sync. Their new program to The Unknown Known is moody and intense, but it’s going to require clean skating to have the proper effect. Their PCS was strong (64.29) and they were 2nd in the LP, but only 4th overall. 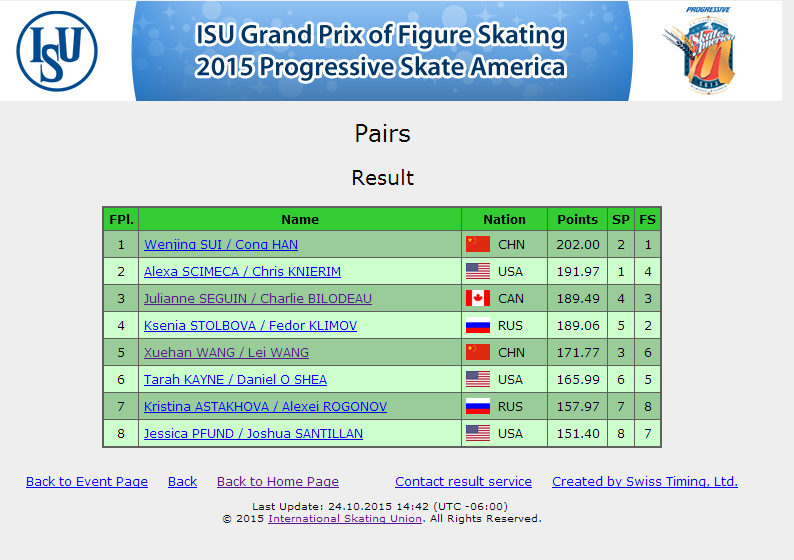 Ksenia/Fedor’s result here was kind of shocking. The odd thing is, their basic skating looked as good as ever. Watching them live, I was really impressed with their unison, speed, power, and partnering skills. Ksenia, in particular, is a striking figure. My eye was constantly drawn to her in warmups and practice. I don’t think there is another female pairs skater in the world who carves and works the ice like Stolbova (except perhaps Marissa Castelli). Her new short haircut matches the aggressiveness of her skating. And her costumes are just as bold!! The black SP costume, cut down to her lower waist in the back, was stunning and attention-getting, to say the least. For his part, Fedor looked a bit solemn in warmups and practice, and given the problems on their twist and even the lifts, I can see why. Several times during practice, he worked on his throwing motion for the twist, as if it were not coming naturally right now. He and Ksenia skated apart for at least half the time during practices/warmups. I’ve never seen them in competition before, so this may be their regular practice, and not a sign of tensions. When they do join hands, the skill is still very much there, but something just seems to be off with their timing, confidence, and/or comfort level. For Stolbova/Klimov, the good news here was landing their new SBS 3T/3T/2T. If this element becomes consistent, it will be a major weapon for them. They had the highest base value in the LP, due to the combo and five level 4 elements, so that’s encouraging. One thing they can work on is lifts. Seeing them in person, Stolbova/Klimov’s lifts lack a bit in ice coverage (in part, I think, because they don’t incorporate any carries), and also Fedor’s footwork didn’t look quite as strong as in the past. So, things to work on. I hope Stolbova/Klimov can sort it all out, because seeing them live reminded me of how much they have to offer this sport. This was Wang/Wang’s first international competition in 10 months, and the rust showed. Things started off well enough in the SP. The highlight was their excellent throw 3Lp, which had a gorgeous, smooth landing and earned up to +3. Their lift was also lovely, with great coverage. Wang/Wang are repeating their “Romance” SP from last year; it’s a lovely, gentle program and suits their style perfectly. They placed 3rd. Unfortunately, Wang/Wang had quite a few problems in their My Fair Lady LP (also repeated). They doubled both SBS jumps, and Xuehan fell on both throws. The triple twist was excellent, though, and the lifts were good. They fell to 6th in this segment/5th overall. I enjoyed watching Wang/Wang live. Their pairs elements are strong, and Xuehan has such a radiant presence. That said, they do lack power and deep edges in their skating. I think Wang/Wang really need more experience on the international stage. Two competitions a year just isn’t enough for them to grow and develop the way they need to. I would like to see the Chinese federation send them to a couple senior B events next year; I think it would help. The way things stand now, they are on course for a disappointing season compared to last year’s 2 GP bronze medals. It was a disappointing event for Tarah/Danny as well, especially following their victory last month at U.S. International Classic. They presented their Espana Cani SP well, with a nice step sequence and lots of choreographic flourishes. However, the elements were problematic. The triple twist almost didn’t get off the ice and received all negative GOE. Tarah had to put both hands down on the throw 3F, and the death spiral was not low enough. They were 6th. Things didn’t get much better in their Phantom of the Opera LP. The opening twist had a Tano position but was low and crashy. Tarah fell on the SBS 3S and throw quad Salchow, and both elements were underrotated. The SBS 2A/2A sequence was good, and there was an exciting choreo lift into the throw 3Lz, but the actual throw itself was a bit small and two-footed. They ended with a good lift that tied in nicely to the music, but placed 5th in the LP/6th overall. The good news for Tarah/Danny is their base value was higher than some of the other teams, which kept them a little higher in the standings. However, I’m concerned that they may be going for too much difficulty with the throw quad. What they’re gaining in base value, they’re giving up in GOE. They were the only team in this event with negative GOE overall in both programs. Tarah/Danny are still working to build a reputation internationally; the way to do that is with consistent, good-quality performances, not a lot of failed jump attempts. Their programs this season are fine, and they interpret them well as always, but I’d like to see them try something more innovative and interesting. In their fourth year as a pair, I think Tarah/Danny are capable of stronger material than they have right now. I was surprised to see Astakhova/Rogonov place so low here, especially after almost winning at Ondrej Nepela a few weeks ago. Their short program to The Artist was okay. They hit very good SBS 3Ss, but the throw 3Lz was small and 2-footed. The step sequence at the end was wonderfully choreographed and performed, but they placed 7th. In their “puppet master” long program, they lost 7+ points when the first lift failed. 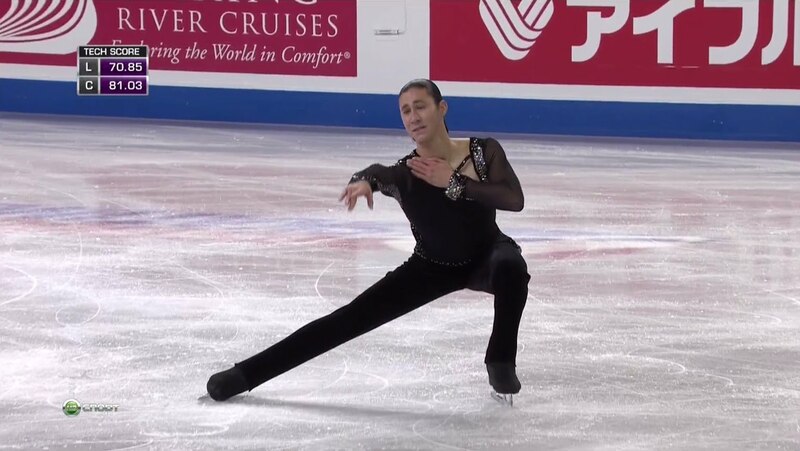 They also doubled the SBS 3S, and Alexei stepped out of the 3T in their jump combo. The real problem with both programs, though, is they didn’t get much positive GOE on any of their elements. Also, they didn’t hit their levels. They only had two level 4 elements in the whole event, whereas many pairs had 4 or 5 in the LP alone. It’s really too bad, because their programs this year are so interesting. The choreography is stunning and the costumes wonderful. Watching them live, they definitely have that trademark Russian attack, power, and polish. But Kristina/Alexei need to bring up the quality of their technical elements. This was the Grand Prix debut for this new American pair, who have been together less than a year. Pfund/Santillan put out a very nice, lyrical short program to “Gravity.” Their SBS 3Ss were excellent, very close together and perfectly synchronized. Their throw 3Lz looked slightly two-footed, and the lift was a bit slow. But they had nice performance quality throughout. They placed 8th. Their Prince Igor/Polovtsian Dances LP was really strong, especially for a new pair. They stayed focused throughout and landed all their major jump elements cleanly. They do need to work on lifts a bit; their lift entrances are labored and the speed slow. Hopefully, this is just a matter of practice and timing. They also need to work on skating skills, which are a little weak compared to the top teams. But they have a nice look together and good musicality. Polovtsian Dances is very “big” music and often overwhelms skaters, but I thought they kept up well with the pace and intensity. They placed 7th in the LP/8th overall. The future looks promising for this new pair. The pairs event at Skate America started strongly but fell off a bit in the LP. Some of these pairs have quite a bit to work on before their next events; it’ll be interesting to see how they respond. Meanwhile, the Grand Prix series continues next week with Skate Canada, where we’ll see Duhamel/Radford for the first time. Should be interesting! !